The LG BD390 is here, and it's taking on all comers. In fact, LG is now setting its stall a step further ahead of some of the rest of the BD field. This machine isn't just a Blu-ray player, it's an entertainment centre, and a showpiece for innovation. Well, except in the design stakes. Indeed, if plagiarism is the sincerest form of flattery, Sony should be blushing for months. The BD390 looks almost exactly like Sony's year-old BDP-S550. That's not exactly a bad thing, as the blue-mirrored fascia of the Japanese model was one of its highlights, but I've been to LG's Design Centre and, as far as I could see, they had drawing boards, paper and pencils... I think you get what I'm saying. The rear view also offers little in the way of surprises, although there is the welcome presence of a set of 7.1 analogue audio outputs. While the deck is capable of decoding and bitstreaming Dolby TrueHD and DTS-HD Master Audio soundtracks through HDMI (and down-mixing to pass-through optical), this means the LG can feed an older amplifier with high-resolution coughs and burps. It may also come in handy if, like me, you've completely filled your HDMI quota with a host of other toys and gadgets. The LG BD390 hides a USB 2.0 port on the front under a weird mini-flap. It's for media-playing purposes, and that's its only role. Unlike some BD decks, this player doesn't need a memory stick for storing BD-Live content and profiles – it has 1GB of internal storage. The polite thing to say about BD-Live is that it's 'still in its infancy as a concept'. What that really means is that it's mostly a load of crap. However, while some of us couldn't care less about downloadable trailers, extra commentary tracks and the like, to say that you're not bothered if your player doesn't do it correctly, is like saying that you're not bothered if your car doesn't have air conditioning – most of the time you don't even notice, but there will be the occasional scorcher (such as the US Director's Cut edition of Watchmen) where you'll be pining for the choice. And, with its internal storage, that's exactly what this sub-£300 deck offers. It's hassle-free and there if you need it. You can't argue with that. Also lurking on the LG's specs is Wi-Fi , another technology that will help with BD-Live and much more besides. And there's no wireless dongle needed here – unlike Samsung's BD-P3600, the BD390 has its capabilities hidden within. The receiver is compliant with the higher bandwidth specification of 802.11n (as well as 802.11b/g). This means that, should you have a suitable wireless router, not only can you access such features as the aforementioned BD-Live, YouTube and firmware updates with the same speed as a wired LAN connection, but you can also stream HD video from a PC. This deck also comes with full DLNA (Digital Living Network Alliance) certification, and it's got the badge to prove it. In essence, it can stream music, pictures and video stored on a computer or NAS drive straight to your screen. And thanks to the 'n' part of the 802.11n compatibility, it does so smoothly and extremely quickly (at the touch of a button). Generally, any lag is down to the speed of your PC. 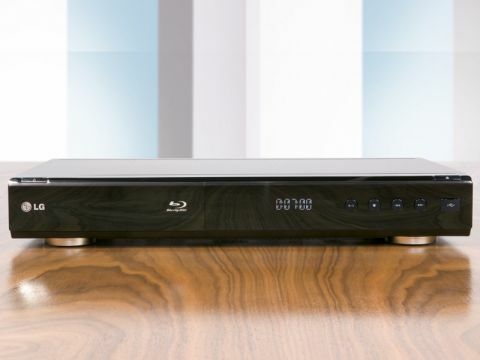 DLNA-compliance isn't exactly new to a Blu-ray player – a Pioneer BD deck offered a basic form of the technology for music streaming, and the PlayStation 3 has been doing it since its launch – but it's the sheer wealth of file types that the BD390 recognises that astounds. Like with its predecessor, this deck can play MKV files. These are, essentially, but not exclusively, files that combine both high-definition video and 5.1 audio into one simply-designated lump. You're most likely to come across them if you are sailing the choppy waters of the Torrent websites, as they are the file-type commonly associated with Blu-ray movie rips and 720p-encoded episodes of American TV shows. However, the BD370 machine could only play them if they were on a USB stick or on a recordable DVD, with the former being restricted in filesize and the latter sometimes refusing to work, depending on the video itself. The BD390 though, can play them through the ether (wired or wireless), straight from the computer they were downloaded onto, or created on. Indeed, legality-aside (because it's a grey area at present) you could rip your own Blu-rays to a suitably large hard drive or NAS box and play them in the living room through the LG without leaving your seat – like an HD video jukebox. Superb. And that's not all. You might even decide to use a different file-type for quality or size. This deck can recognise other HD codecs, such as VOB (MPEG) and AVCHD. It even carries full DivX HD certification. Robert Baden Powell didn't have this many badges. And the LG plays these HD codecs with aplomb. Despite most being encoded at 720p rather than 1080p, the replay quality is excellent. Even when stretched to fill a 55in LCD TV, crispness and fine detail holds up. Standard DivX and XviD fare is a lot softer, but that's entirely the codec itself. Essentially, no matter the resolution, the LG displays the source video exactly as created, sometimes warts and all. Of course, Blu-ray-playing prowess shouldn't be forgotten amongst all my fawning over the feature-list. DLNA-certification and Wi-Fi aside, it'd be a sorry state of affairs should the BD390's capabilities to spin a BD movie be hampered. Thankfully, they aren't. I'm not one to entirely trust subjective viewpoints alone, which is why I always test a player with a range of discs, including the Silicon Optix HD HQV Benchmark Blu-ray, and PAL DVD for upscaling purposes, and this deck passed every single test on both discs. That's impressive for a sub-£300 machine, and equates to both generally excellent-looking HD and SD video. To put a more real-world spin on it, I also fed the BD390 with the US Watchmen Director's Cut BD, and was agog at the expansive details in the shadows (it's a very dark movie in more than one sense), the filmic levels of detail, and the vibrancy and depth of the characters' crime-fighting togs. I'm sold. The player is also impressive with loading times, and pips the Samsung BD-P3600 by a few seconds. In fact I would say that it is as speedy loading a Blu-ray disc as the PlayStation 3 (the original one), even a title that's Java-heavy. There also didn't seem to be a time difference between BD and DVD on load up. If there's one element of the BD390 that's not got quite the same wow factor as just about every other aspect of this machine, it's the audio performance. It's good, but not spectacular. For the price, it's more than adequate, and those without experience of high-end audio DACs at work will be impressed enough by a Dolby TrueHD or DTS-HD MA track. But this is an area that would be worth more investment if, say, you built your own home cinema. Other than that, I am extremely impressed with this player. Indeed, I'd go as far to say that this is the best Blu-ray deck I've encountered yet. I can't fault its video performance at all, and its feature count is astonishing. If you're looking to create a high-definition entertainment hub in your living room, this is it.